Many plants contain high levels of saponin, which is very soapy stuff. In the Hong Kong region, Chinese peasants traditionally used the small yellow fruit of the soap berry tree (Sapindus mukorossi) to make soap. Very easy to make: simply grinding up the rind and soaking it in water produces a soft liquid soap used for washing and as a shampoo -- popular with village women because it "beautifies the skin and removes freckles". We tried it, some villagers showed us how to make it -- the soap worked really well, but we're not sure if it beautified us at all. 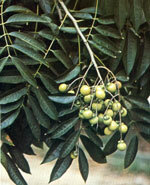 It's quite poisonous though -- drinking saponin will turn your blood into detergent. It's also a powerful fish poison. And, according to Dr James Duke's Phytochemical and Ethnobotanical Databases, it's also used in various parts of the world as a pediculicide, to treat boils, for chlorosis, as an emetic, for epilepsy, as an expectorant, to treat gum disease and bad breath, as a skin treatment, and to exorcise demons. Both the fruit and roots are used in Chinese traditional medicine -- the fruit is steamed and dried repeatedly to remove the poison. It's used to treat colds, fever, acute bronchitis, cough, diphtheria, sore throat and indigestion. Dr Duke lists the seeds of the horse-chestnut (Aesculus hippocastanum L.) as having the highest levels of saponin: 260,000 ppm. They don't grow here, so we haven't tried making soap out of horse-chestnuts. It's also a fish-poison. Dr Duke lists the following uses of the horse-chestnut: as an alterative, analgesic, anodyne, astringent, for backache, for cancer, to treat fever, as a hemostatic, to treat malaria, as a narcotic, for neuralgia, pertussis, piles, rheumatism, rectitis, sclerosis (breast), sores, as a vasoconstrictor, as a tonic, and as a poison. In an interesting article called "Promising Phytomedicinals" he lists the horse-chestnut as a source of Aescin (anti-inflammatory). The Canadian Poisonous Plants Information System says horse-chestnuts "have poisoned cattle, horses, and pigs, causing sickness and death. Human poisoning has also occurred". Here's some 100-year-old prescription information for this soapy poisonous tonic medicine, from "Potter's Cyclopaedia of Botanical Drugs and Preparations", by R.C. Wren, F.L.S., Potter & Clarke, London, 2nd Edition. ActionTonic, narcotic, febrifuge. The bark is used in intermittent fevers infused with boiling water1 ounce to a pintand given in tablespoonful doses three to four times daily; this has also been used as an external application to ulcers. The fruits have been employed with success in treatment of rheumatic and neuralgic disorders; also for rectal complaints, backache, piles, &c.
PreparationsFluid extract, fruit: Dose, 5-20 drops. Fluid extract, bark: Dose, 1/2-2 drachms. Distinctive characterThe bark occurs in flattened pieces 4-5 inches long, and about 1-1.5 inch broad, alla about 1-1.25 inch thick, greyish brown externally, with corky warts tangentially elongated on the inner surface, pinkish brown, and finely striated longitudinally. Fracture finely fibrous and laminate towards the inner surface. Taste, bitter and astringent. Odour, none. The fruit is a capsule, splitting into three valves, with short spines scattered on the surface, each containing a large brown polished seed, about 1 inch broad and inch thick, with a large dull, rough, and pale brown scar where it has been attached to the capsule. Seed white, giving a blue fluorescent infusion.